Kehorne were there, did you support us? Never too late! What a night! Luckily it was dry (until 5.30am when the rain started but seeing as wake up was 6am it didn’t seem to matter) – cold but dry and I’ll take that any time! 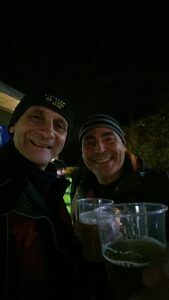 We set up our “luxury” boxes to sleep in and got kit squared away then wandered around the “camp” to get a bite to eat and a beer – it’s not all hard work this raising money for the homeless. 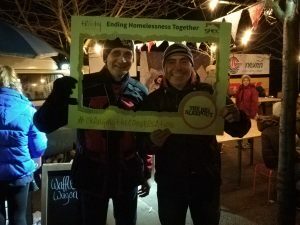 So Dave and I started to enjoy the evening – plenty of activities, a comedian, talks from people who had experienced first hand the issue of rough sleeping, a disco from Brandon Block, a band and more comedy. By the time the events closed we were really ready to get into sleeping bags…it was cold but in my past I’ve been put through much worse by professionals in the wonderful Parachute Regiment … but I’m now a weak and pasty civilian! What was perhaps the most impressive was a chat from Eric Pelly who I did catch up with later. He had been homeless for 7 years and was selling the Big Issue. He was one of the first to be involved in this – I will now promise to always buy one of these! He talked about how sleeping rough is a dangerous and depressing thing, you get beaten up, urinated on, people are sick on you, steal your stuff, damage your stuff, even other more desperate rough sleepers are looking to make your life more difficult! This guy fell into homelessness by losing his business then his home – marriage not long after this if my memory serves me. But what he did was share his story and I thanked him later for this as without people sharing what the issues really are we, the general public, just miss it all and how can we understand without these brave people standing forward and sharing. He said if anyone really wanted to experience true homelessness he would take them out – I’ve been through some pretty nasty stuff in my life but to be honest I don’t think I would happily put myself into this situation. So overall a great event – well done to Trinity for putting this on – I’m sure it was lots of hard work but I really appreciate it and I feel I learnt more and will help more. November 30th 2018 Kehorne will be taking part in the ‘Big Sleepout’ in Uxbridge, arranged by Trinity a local charity that is trying to help homeless people in Slough. Kehorne along with other companies in the area will be sleeping outside in cardboard boxes for one night only (thankfully). This will hopefully help to raise awareness of the problem and also raise funds for this local charity in their effort to make life a bit better for homeless people. If you want to donate some money and sponsor us, below is a link to the website, it does not matter how much you give, it will all be welcome. It is easy at this time of year when we go back to our warm houses to realise quite how hard, not to mention dangerous and cold it is for homeless people. In Slough recently there was a tent slashing incident in a church yard where some homeless people had set up tents. It is shocking quite how easy it can be to end up homeless, the loss of a job, the breakdown of a relationship with family or a partner, just a few missed payments on rent or a mortgage. Once you have fallen between the cracks, and are of ‘no fixed abode’ it can be unbelievably hard to reverse the situation. For many the shame of being in that situation along with a desire to hide it and not be a burden on others very quickly become barriers to resolving it. There is of course the lack of affordable housing, the need to have references and a deposit, as well as managing to hold down job to ensure a regular income whilst dealing with being homeless to contend with. It is a lot to deal with, so charities like Trinity cannot give all of the solutions, but they can help people to get out of this situation. On a personal note, many years ago I had a situation where I could quite easily have ended up homeless, I didn’t thanks to the kindness of friends (Paul mostly), but it was a real possibility at one point. That is why we are supporting this and sleeping in a cardboard box for just one night. So if you can, support us and sponsor our night in a carpark, somewhere in Uxbridge. We will be updating on Facebook, and I will be doing Facebook live from the carpark.